My shop runs a small rental program. There are all sorts of ways to damage an instrument, and I’ve seen them all, I think. 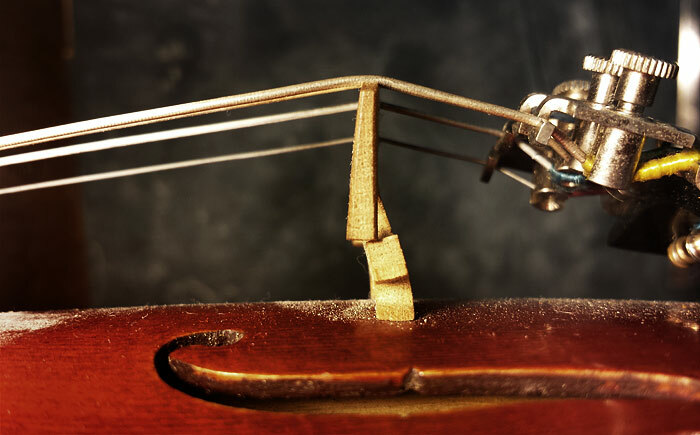 This is the bridge on a tiny violin, a 1/32, perhaps. In this case, the bridge was permitted to warp forward by the natural pull of the strings. Then at some point, I think the teacher noticed and pulled the bridge back, perhaps a bit too far. On the really tiny violins I often leave the bridges thick because the violins don’t have any sound, anyway, and a thicker bridge stands a better chance of not warping. You can see how much good that did this time!